Descend into the cover of darkness in the iconic city of Austin, TX with a nationally acclaimed storyteller. 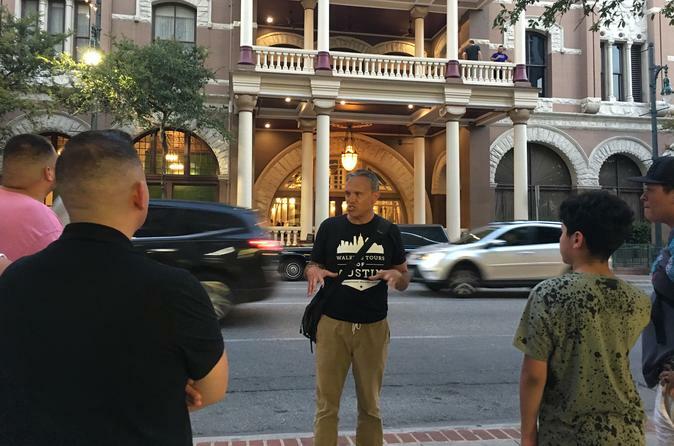 Your expert guide will keep your small group scared and entertained during this 90-minute walking tour with historical tales of murder, mystery and of course, ghosts. In addition, you will explore the little known nooks and crannies of Austin and visit popular attractions like the Driskill Hotel. Make your way over to Jo's Coffee at 8pm to begin your 90-minute ghost walking tour of Austin. Retrace the paths of serial killers, explore historic crime scenes throughout the city, and learn about hauntings that occurred in Austin. Gain inside information from an expert guide while uncovering hidden stories of Austin that you will not read about in a textbook. The tour will include many breaks and will be conducted at the pace of a leisurely stroll. In addition, you will have the opportunity to visit one of Austin’s most popular and beloved attractions, the Driskill Hotel as well as view popular street art.